Unknown to the general public but fascinating to followers of Stanley Kubrick, the name Leon Vitali takes center stage in Tony Zierra’s “Filmworker.” Vitali, who moved from the onscreen role of Lord Bullingdon in “Barry Lyndon” to the offscreen one as Kubrick’s general factotum for a quarter of a century, may have been credited as the famous director’s “personal assistant,” but Zierra reveals the astonishing extent of Vitali’s loyalty. 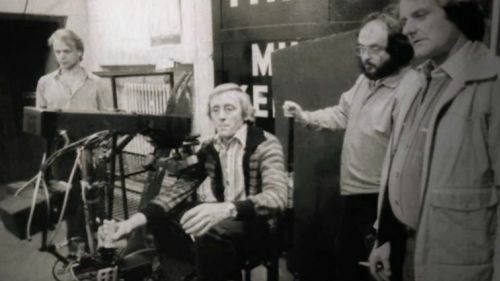 Drawing from a deep trove of Kubrick-related media, including extensive clips from the master’s films, it goes without saying that “Filmworker” will be sought by Kubrick completists, but the movie also appeals to anyone who has been seduced by the process of motion picture making. Zierra’s own filmmaking style is a far cry from the meticulous aesthetics brought to the screen by Kubrick. Mostly static talking-head interviews with Vitali -- unremarkable in framing and locations -- form the central narration, but Zierra invites a couple dozen others to speak on camera, including Kubrick performers Ryan O’Neal, Danny Lloyd, Matthew Modine, Tim Colceri, R. Lee Ermey, and Marie Richardson. Just as valuable are the appearances of Vitali’s fellow below-the-line filmworkers, many of whom attest to the devotion and self-sacrifice of their friend and colleague. “Filmworker” retells a few anecdotes well-known to Kubrick fans: the physical beating Vitali took from O’Neal in take after painful take; Vitali’s careful handling and mentoring of Lloyd; the replacement of Colceri with Ermey as Sgt. Hartman in “Full Metal Jacket.” Vitali, candid and open about his reverence for Kubrick if not the full extent of the personal costs it exacted on him, speaks with pride of his wide-ranging career accomplishments. Zierra builds several excellent sequences detailing Vitali’s sponge-like thirst for film production knowledge and the benefits it yielded (and continues to yield), including a virtually perfect and encyclopedic recall regarding Kubrick’s exacting color timing specifications. Alongside Harlan’s own “Stanley Kubrick: A Life in Pictures” and other authorized content, Zierra’s documentary joins Kubrickiana like Jon Ronson’s “Stanley Kubrick’s Boxes,” Rodney Ascher’s “Room 237,” and Alex Infascelli’s “S Is for Stanley” in a growing media library that accompanies the massive print collection of material dissecting various aspects of Kubrick’s life and work. In this particular case, Vitali’s own allegiance won’t dispel any of the mythology surrounding Kubrick’s often contradictory sides (gentle/ferocious; warm/distant; esoteric/down-to-earth, etc. ), but Zierra does manage to achieve something tangible: a well-articulated and wholly compelling argument that no matter how one feels about the auteur, moviemaking is a collaborative art.